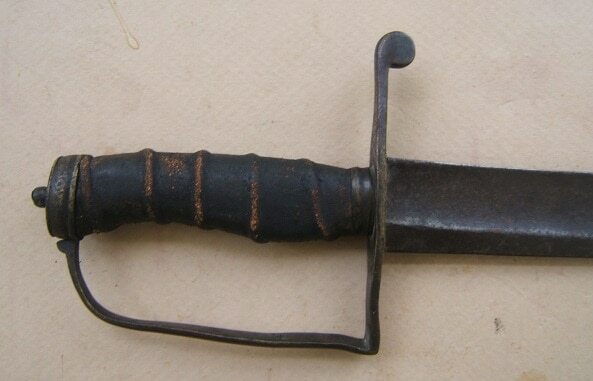 A VERY GOOD UNTOUCHED COLONIAL AMERICAN/REVOLUTIONARY WAR PERIOD HANGER/SABER, ca. 1750-1770: In overall very good untouched condition. American blacksmith made clip-point, unmarked, 22″, single edge, wide, curved blade with a fuller for its full length and a reinforced back: untouched cutting-edge. The American-made brass hilt with a simple turned pommel and ball-type finial, an integral D-type knuckle-guard with a straight, upper quillion: the inner face of the cross-guard with an “No./59” Rack/Unit? Marking. Complete with its original leather covered, wooden grip with its cord “under-wire”. Retains an untouched age patina with some scattered handling marks, scuffs, minor abrasions and signs of use. In overall very good+ untouched condition with deeply toned steel, leather and brass surfaces. The blade retains its original cutting edge with untouched russet surfaces, some scattered light discoloration and some expected pitting. 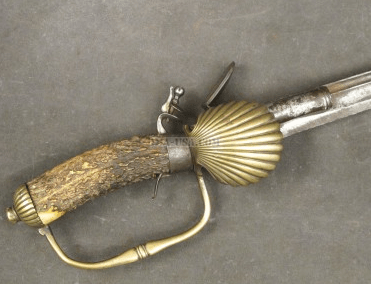 Very good hilt with smooth, dark, mustard-toned, brass surfaces and the face with the noted Colonial/Revolutionary War Period, American unit/rack number. 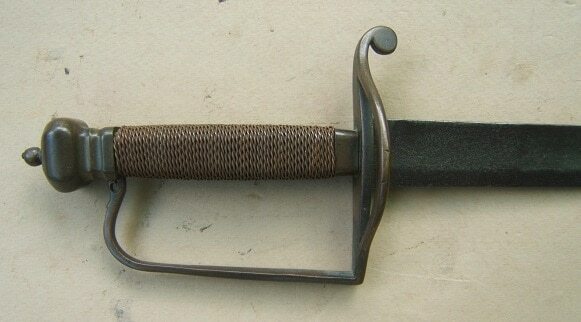 A very nice example of a Classic American made Hanger/Saber from the Colonial/Revolutionary War Period, ca. 1750-1770. Overall length, 27″. For similar examples, please see G. C. Neumann’s: “Swords & Blades of the American Revolution”.